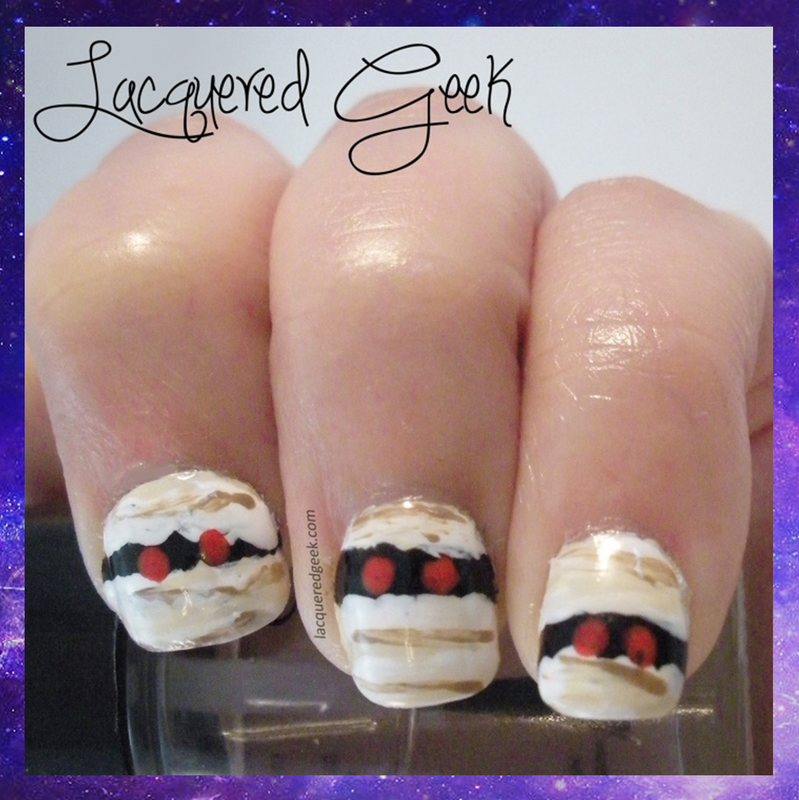 Lacquered Geek: Halloween Nail Art: Mummies! Greetings! It's Halloween week! Halloween was one of my favorite times of the year growing up. I loved getting to dress in costumes and go trick-or-treating! As an adult, I still enjoy Halloween, but just not to the same extent as a kid. I don't like being scared/terrified, so most of the Halloween events (like haunted houses) just aren't my thing. To help get me in the Halloween mood, I'm going to be doing Halloween nail art all this week! 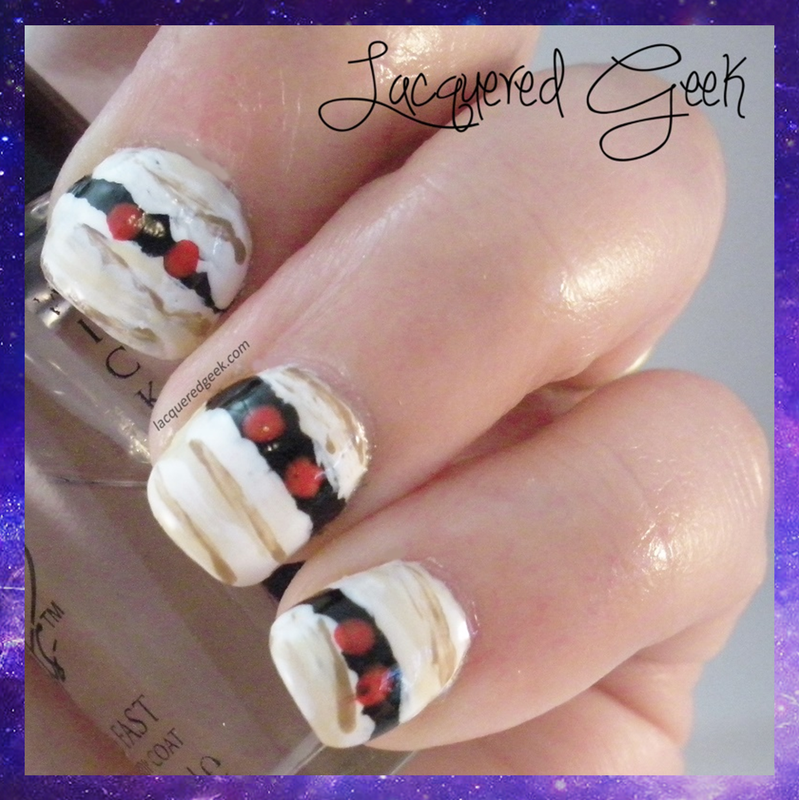 For the nail art this week, I wanted to do nail art looks that could be easily done by anyone. My nail art skills are very much beginner, and I usually shy away from doing them because of that. But practice makes perfect! I also wanted to show that you don't need lots and lots of polishes to do nail art. I tried to stick to just a few basic colors for all the looks. I know not everyone is a nail polish addict! First up this week is Mummies! I started off with a 2 coats of Zoya Jacqueline. I then painted the black part of the eyes with Zoya Raven. 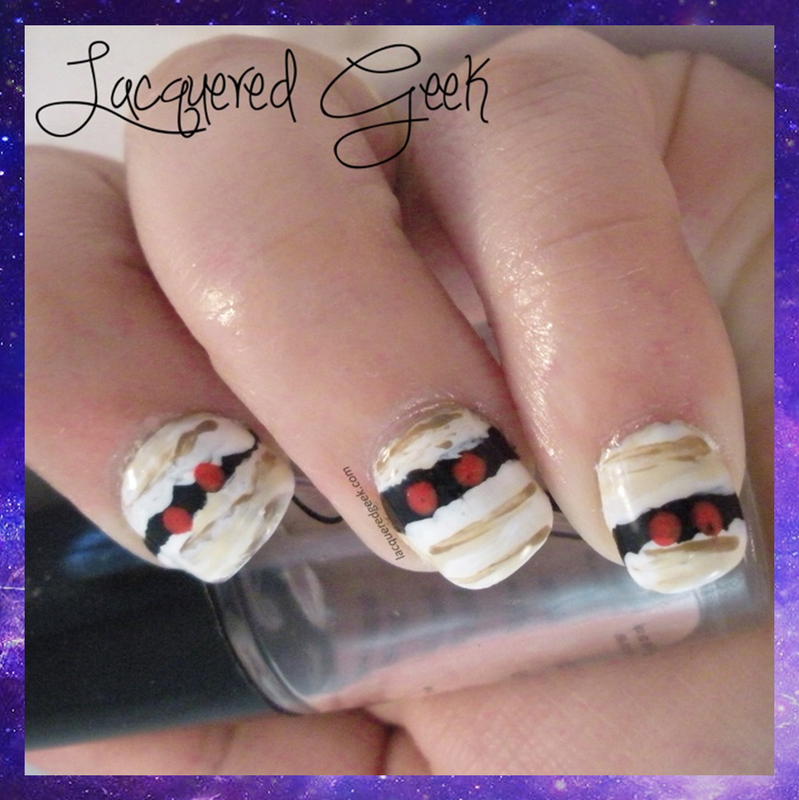 Using OPI Alpine Snow and an art brush, I added the white stripes to show the mummy's bandages. To make them look a little messier and aged, I added a couple streaks of Zoya Flynn. Finally, using a dotting tool, I added the red eyes (OPI Red My Fortune Cookie). If you don't have an art brush or a dotting tool, you could still achieve this look with a bobby pin and a toothpick. Next time, I do this look, I think that I will use a smaller art brush for the bandages. They dominated the look a bit too much I think. What Halloween ideas have you come up with for your nails this week? We just did pumpkin and mummy toes! :) You'll have to post photos on FB!